THE VIEW FROM FEZ: Learn Moroccan cooking in Fez. Learn Moroccan cooking in Fez. Here at The View from Fez, we enjoy great Moroccan cooking and although we pride ourselves on making our own preserved lemons and cooking a mean tagine, we certainly don't have the skills of Lahcen Beqqi. Recently he has started running small classes on Moroccan cooking so that you can learn the secrets of the local cuisine. As he says, "Moroccan cuisine is said to be one of the most important cuisines in the world and Fes is considered to be the capital of Moroccan cooking. Every visitor to Morocco can savor the delights of its gastronomy when they taste tagines, pastilla, and couscous in the various fine Moroccan restaurants. However, few tourists get the chance to experience the preparation of Moroccan cuisine; something that is essential to understanding the culture. When you take cooking lessons with me, you will experience first-hand the process of food preparation that Moroccans perform every day, from choosing your own fresh ingredients in the open-air market, to cooking in a traditional Moroccan house." Lahcen is not only a great chef, but an excellent teacher and his lessons in Moroccan cuisine are more than simply cooking. The lesson starts in the morning, at around 9:30, when he takes you on a trip to the open-air market (or the “souk” in Arabic), where you will buy all of your fresh ingredients. Lahcen will teach you how to pick the freshest goods. You will also be able to pick up a local wine for your meal. After grocery shopping, you will return for your lesson, which will be held at Dar El-Hana, a beautiful traditional Moroccan home restored to be a guest house. In the beginning of the lesson, Lahcen will provide you with typed and printed recipes for the meal that you will be making. He is more than happy to accommodate vegetarian needs, as well. Finally, what is more satisfying than to eat food that you have prepared? You and Lahcen will eat your dish for lunch, when you may choose to try eating “à la Marocaine”, using bread and your right hand, instead of a fork and knife. The length of the lesson depends on the cooking time for the dish, but usually, a lesson will last about 5 hours (from the grocery shopping to eating). 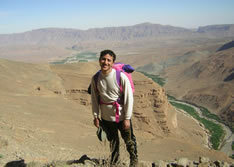 Lahcen is a Berber from the south of Morocco, in the High Atlas. He grew up in Amellago, a small agricultural village in the Gris Valley. Amellago is situated between Imilchil, where the annual Marriage Festival is held, and Merzouga, the entry to the tallest sand dunes of the Sahara. Lahcen’s father is a shepherd and a farmer, so Lahcen spent his childhood in the mountains, taking care of the herd, and in the field, helping his parents farm the land. When he was 10 years old, his parents sent him to another town for school. This is when Lahcen learned to cook for himself. After he got his baccalaureate and finished high school, Lahcen worked in a small restaurant and he became fascinated by the work of the chef. This is when he decided that he wanted to make cooking his career. He went to hotelier school, but he got his most valuable experience when he worked in Azrou alongside a Moroccan chef named Aziz, who had been trained at the world-renowned cooking school in Laussane, Switzerland. With Aziz, Lahcen learned how to make cooking an art. Since then, he has continued to perfect his art. He is adventuresome in his cooking, yet at the same time remains dedicated to exploring Moroccan cuisine from every region of the country. As well as teaching cooking lessons, Lahcen works at a guest house in Fes as the chef de cuisine. This dish is a traditional Moroccan tagine. Because it is sweet and it includes dates, it is often served when a family has company over. Wash the prunes and put them in one liter of water. Let them sit. Put ginger, saffron, and lamb in a big pot. Cook on medium flame. Mix for one minute. Add olive oil and onion. Leave for 5 minutes. Add salt and pepper. Take the prunes out of the water and put them aside. Keep the water! Pour it into the pot with the lamb. Let the meat cook for 1 ½ hours (or however long it takes to cook) on a medium flame. *You can also leave it on a low flame and let it cook longer. Add the prunes and dates in the last 15 minutes. See all our Moroccan recipes here: MOROCCAN MENU!